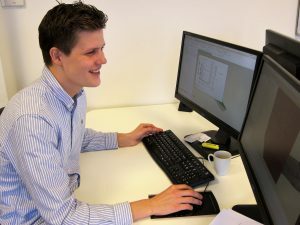 In this post we put the spotlight on Luuk Posthuma, intern at Femto Engineering, as part of our series to introduce the people who help shape our company. Take a moment to read about Luuk’s experiences! Last February I started working on my graduation assignment at Femto Engineering to obtain my BSc in Aerospace Engineering. 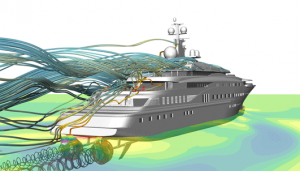 The assignment covers the computational fluid dynamics analysis of a vessel with a helicopter deck. During my graduation I am focusing on a situation in which exhaust gas interacts with wind, causing health problems on the helicopter deck. The flue gas concentration on the helicopter deck exceeds the allowed boundary which results in health problems such as headache, nausea and similar symptoms. The project focuses on the simulation of exhaust gases with varying wind influences and will deliver a detailed report, in which the effects of changeable parameters are described. These findings can be used in the conceptual design of the ship to lower the flue gas concentration on the helicopter deck. Which software do you use for this assignment? To simulate these different interactions, I am working on a parametric CAD model of the vessel. The model is simplified by removing the redundant components which are adding up in computational time while not having a significant influence on the desired research. The CAD model has to be modified before it is possible to use in a CFD solution. This is done in Simcenter 3D before I import it in STAR-CCM+. The benefit of the STAR-CCM+ software package is the ability to process impressively large calculations fast. It is an all-in-one simulation solution, with first-class CFD capablities, that delivers accurate simulations for designs operating under real-world conditions. The simulation driven design aspect in CFD analysis is getting real momentum. CFD analysis can shorten the design time and show important changes early in the design phases. In this graduation assignment it would have much impact as the flue gas concentration could be lowered. The possible design changes can be considered and even used in the final design of the vessel. It is a great experience for me to work in a consulting company, not just to have daily work routines and enjoy all other advantages a company like Femto offers, but also to profit from the expertise of my professional colleagues. Additionally, by working in a team of specialists I get a clearer picture of what my business career in the future might look like. Since I was very young, I always have been interested in engines and motor-sports. I am always very enthusiastic about high-paced cars and related business. I would like to pursue a career in auto racing related business.